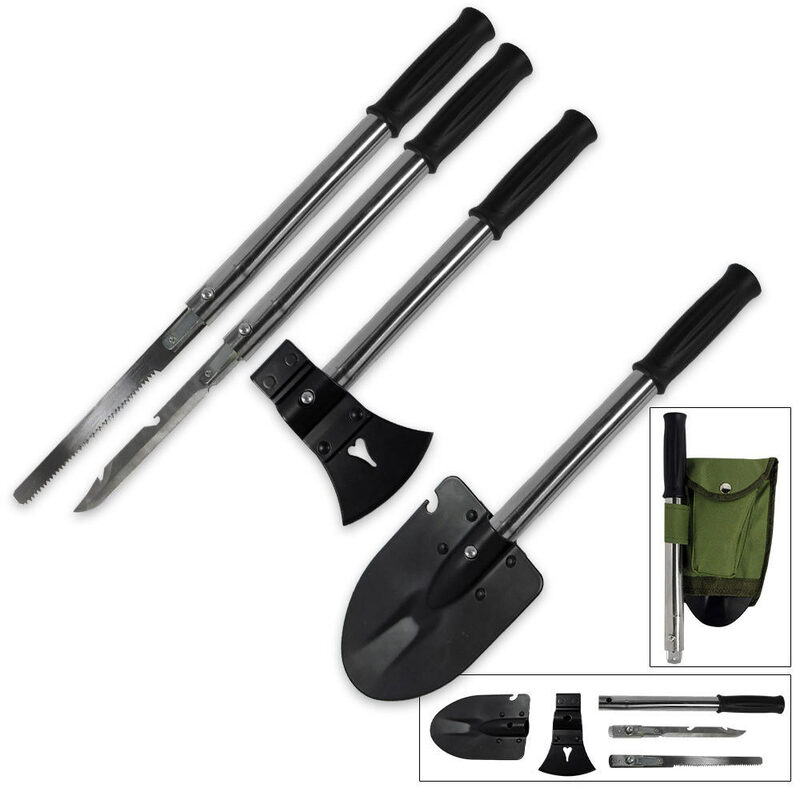 9-In-1 Mini Shovel & Tool Set | BUDK.com - Knives & Swords At The Lowest Prices! Blade: 8" overall; Shovel head: 6 ¾" x 4 5/8"; Saw: 8 ¾"
Conveniently collapses from an extended length of 17 ¾" overall to 12 ½"
Tackle a variety of household, yard, and outdoors chores with this 9-In-1 Mini Shovel & Tool set. Yeah, got it, tried it out....no way. Poor construction, yeah, the knife comes sharpened and the saw is 'ok', but overall a cumbersome tool. The Handle slides around, the shaft deforms with only slight pressure(cracked on me just from inserting different tools). Shovel head is sharp enough to use as a whacking weapon, but not much of a shovel. If I can get the axe head sharpened and keep that edge I will just make my own handle for it, as for the rest....toss it. Very versatile. All blades come factory sharpened except hatchet.